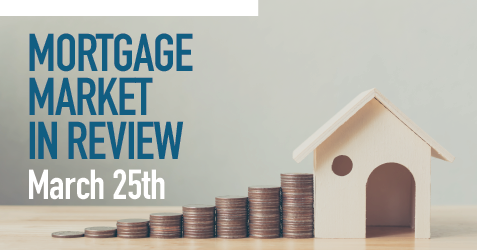 Mortgage bond prices finished the week higher which put downward pressure on rates. Most of the movement was positive and within a narrow range. Rates were steady Monday as the NAHB housing data was exactly as expected. The Fed left rates unchanged and indicated they see no rate hikes this year. Comments from the Fed Chair painted a lower assessment of the economy. Weekly jobless claims were in line with estimates at 221K. The only strength in the data this week came from the Philadelphia Fed business conditions index which was a solid 13.7 compared to the expected 6 reading. Leading economic indicators were exactly as expected. Existing home sales were 5.1M units. Mortgage interest rates finished the week with discount points better by 1/4. 8:30 am, et 1235K Important. A measure of housing sector strength. Weakness may lead to lower rates. 10:00 am, et Up 0.4% Moderately Important. A measure of single family house prices. Weakness may lead to lower rates. 10:00 am, et 131 Important. An indication of consumers’ willingness to spend. Weakness may lead to lower mortgage rates. 8:30 am, et $58B deficit Important. Affects the value of the dollar. A falling deficit may strengthen the dollar and lead to lower rates. 8:30 am, et 227K Important. An indication of employment. Higher claims may result in lower rates. 8:30 am, et Up 2.5% Very important. The aggregate measure of US economic production. Weakness may lead to lower rates. Up 0.1% Important. A measure of consumers’ ability to spend. Weakness may lead to lower mortgage rates. 10:00 am, et 715K Important. An indication of economic strength and credit demand. Weakness may lead to lower rates. 10:00 am, et 97.4 Important. An indication of consumers’ willingness to spend. Weakness may lead to lower mortgage rates. Britain was scheduled to exit the European Union this week in an uncontrolled manner. This had many economists worried about the global consequences. British lawmakers have recently rejected exit deals. EU leaders gave Britain an extension last Thursday to come up with a solution. The timeframe now pushes the date to the second week of April. A deal would have Britain leave the EU in May. If no deal is agreed upon they will face the same scenario they did this week. This is important because global events can move rates domestically.